Our peers in helicopter emergency medical services (HEMS) have been catching a lot of flack in the media recently, due to several high-profile incidents and government investigations. Maybe you’ve been thinking, Thank goodness it’s them, not us. But what are you doing to achieve the safest environment for your staff and patients? You may find my opinion harsh or even critical, but I don’t see much activity at the grassroots level in making ground EMS operations safer. There seems to be an intense focus on “the box,” meaning the area behind the ambulance cab, but not much activity out of (and beyond) the box. Where are the vision, the commitment, the tools and the passion to meet our guiding mission, “First do no harm”? Did I catch you stifling a yawn? Yes, I’m talking about day- in, day-out safety manuals; policies and procedures; documentation; reporting; risk management; hazard identification; and continual improvement. Do you delegate these tasks to others, place them on your management agenda once a month or once a quarter, and recite the mantra “safety first” but shudder when you wake to the phone ringing at night? If so, you’re not alone. I was yawning the night of Sunday, Dec. 14, 1997, after a long day of skiing with friends and enjoying a rare evening at home alone, with my wife and kids visiting out-of-town relatives. I was just getting into bed when the phone rang at 9:31. On the other end of the line was my communications specialist, who, voice wavering, said, “We have a helicopter down.” Tragically, EMS helicopter N771AL struck wires on takeoff from a multi- casualty accident scene in Littleton, Colo., impacting the frozen ground upside-down at an estimated 23 G. Two medical crew members, flight nurses Leslie Feldmann and Beth Barber, along with pilot Pete Albplanalp and a critically injured patient, died instantly. In the blink of an eye, lives were lost, and lives changed. While most were celebrating the holidays that December, AIR LIFE Denver, along with an outpouring of the EMS community, wept publicly, attended funerals, consoled grief-stricken family members and privately wondered, Are we safe? My own river of tears carried the crushing weight of responsibility for lives lost on my watch. Had I put safety first? Could I have done something differently? Concern for the safety of my program and team became overwhelming. Could I face a wife, husband, parent, child or the community at large and say I had done everything in my power as the steward of the service to develop, maintain, promote and ensure the safety of the lives entrusted to me? Had I been honest that the base- line risk in EMS transportation isn’t zero? (Emphasis added.) Thus began my quest for answers to these difficult yet imperative questions. Think it only happens to the other guys? “Ambulance involved in fatal accident”: CBS Philadelphia, Oct. 10, 2010. “Police say ambulance driver fell asleep before head-on crash”: Floyd County, Ga. (WRCB), Oct. 14, 2010. “Ambulance carrying accident victim hit on I-95”: Green- wichtime.com, Oct. 17, 2010. “Massachusetts ambulance, vehicle crash left Taunton man dead: 3 hurt”: Justicenewsflash.com, Oct. 27, 2010. In fact, according to a 2002 report in Annals of Emergency Medicine, the transportation fatality rate for EMS workers is nearly five times that of other U.S. workers. That same re- port found that in the 10-year period from 1988 to 1997, there were more than 350 fatalities and 23,000 injuries to people involved in ground ambulance crashes. And a Canadian study concluded that the fatality rate in ground EMS was 1.7 per mil- lion ground miles traveled, higher than HEMS at 0.4 per mil- lion air miles traveled. Enough said? The Association of Air Medical Services (AAMS) has developed a goal of “zero errors of consequence” in air medical transport, coined Vision Zero. A worthy vision no doubt, but how does that translate to the everyday, sometimes mundane safety activities at our organizations? How does the “vision” allay the fears of a family member when his or her loved one leaves for work each day? Enter the concept of a high reliability organization (HRO). An HRO is an organization that has succeeded in avoiding catastrophes in an environment where normal accidents can be expected due to risk factors and complexity. In other words, an HRO is an organization that conducts relatively error-free operations, over a long period of time, making consistently good decisions, resulting in high-quality, reliable operations. Sound too good to be true? Well, if the goal is a high reliability organization, then the “how” is through the development of a safety management system (SMS). In the toolbox of the HRO, an SMS is a coordinated, comprehensive set of processes designed to direct and control resources to optimally manage safety, which takes unrelated processes and integrates them into one coherent system, facilitating proactive hazard identification, promoting a safety culture (attitudes, behavior, ownership), and providing a systematic way to control risk and to provide assurance that the risk controls are effective. 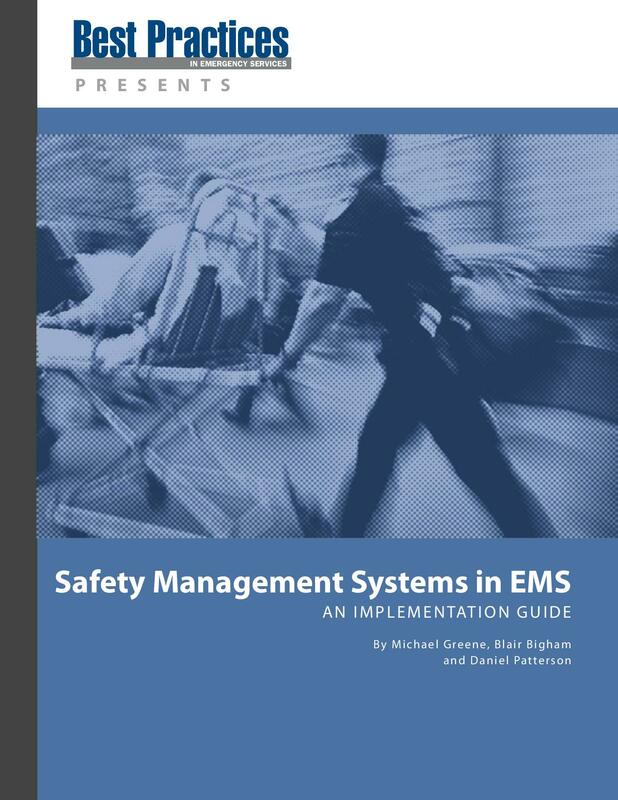 Thanks to the foresight of editor in chief Keith Griffiths, Best Practices published a series of safety columns, written by myself and safety experts Daniel Patterson, Ph.D., assistant professor in the Department of Emergency Medicine at the University of Pittsburgh School of Medicine; and Blair Bigham, MS, a Toronto ground and air paramedic and an internationally recognized investigator/researcher for the University of Toronto who has been involved with a variety of safety-based studies. Specifically, this series will help you transform your organization into an HRO through SMS development. Each month, we will help you build your own SMS, pillar by pillar, starting with a solid foundation and ending with a roof to weather the safety storms. Got your attention? Then stay tuned! Rules, policies and procedures, along with a good dose of attitude, behavior and ownership, got me safely home to my family. Most aboard that flight did not consider the magnitude of what had occurred; they simply, and instinctively, trust- ed the system and the crew. Passengers expected a safe flight home—and that’s what they got. Do we think our patients expect any less than a safe trans- port to the hospital? 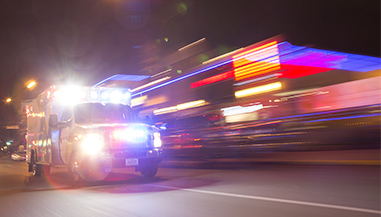 Without thinking or verbalizing it, the general public expects their EMS organization—its policies and procedures, staff and culture—to deliver. Figuratively and literally, the public expects EMS to be highly reliable and safe. And how do we make sure we fulfill that expectation? Last month I introduced the concept of a high reliability organization (HRO) and the toolkit of an HRO: a safety management system (SMS). The design of an SMS is like that of a house: a strong foundation (the organization’s safety culture); four corners or pillars (policy, risk management, assurance and promotion); the internal contents (11 elements of SMS); and a roof (leadership). While SMSs are designed around the “four pillars” concept, I believe a truly effective SMS can only be built on a solid safety culture, shielded and insulated by leadership, and connected and supported by the four pillars. In other words, culture and leadership deserve (and demand) special emphasis. Now let’s start at the top and work our way down. At a recent conference, I asked a group of 50 or so EMS leaders if they give their employees “stop work authority” if conditions are unsafe or “timeouts” if workers are fatigued, key elements of leadership in an SMS. The response was mediocre at best. This is indeed unfortunate and means that our EMS workers continue to demonstrate risky behavior, such as working beyond the point of fatigue and falling asleep at the wheel. My advice to this group and you: Don’t let tragedy be- come your wake-up call. Holding up the “roof” of the SMS are four pillars: policy, risk management, assurance and promotion. Each pillar contains key elements that define the overall system. The first pillar: An SMS must have written, accessible policies and procedures in place: the first pillar. These policies must explicitly describe responsibility, authority, accountability and expectations within the organization. All job descriptions must include these elements. Key safety personnel are identified and described with commensurate scope and authority. Emergency preparedness and response is preplanned, known to all staff and practiced through regular emergency drills. And the most important aspect to safety policy, documentation and record keeping? Documentation. As the old proverb says, “The job isn’t done until the paperwork is done.” Documentation captures organizational knowledge, activity and behavior consigned not only to posterity, but also as evidence to an accrediting organization or a legal inquiry. The second pillar: Risk management, the second pillar, is deliberate early recognition and management of potential problems. Risk management is a formal system of hazard identification and management and fundamental in controlling an acceptable level of risk. A risk management system describes operational processes across department and organizational boundaries; identifies key hazards and measures them; methodically assesses risk; and implements controls to mitigate that risk. A fatigue risk matrix and assessment, periodically applied during a work shift, is an example of risk management. The third pillar: With policies, measurements, assessments and controls in place, the organization must incorporate regular data collection, analysis, assessment and review to ensure that safety goals are achieved—assurance, the third pillar of an SMS. Key elements within safety assurance are safety performance management (monitoring, audits, evaluations, investigations, RCA, employee reporting, data analysis, assessment, and preventive and corrective actions), a defined change management process and continual improvement. The fourth pillar: To promote safety—the fourth and final pillar—an organization must train and communicate safety as a core value. Safety promotion begins early with employee recruitment and selection, and continues from Day One with explicit competencies, training and personnel expectations in regard to safety. New employees must be socialized into the safety culture early on. Safety is then promoted through communication and awareness. Part 3: What’s the State of Your Organization’s Safety Culture? Measure It! Those of us with a few years under our belts probably remember our early days in EMS, when the thrill of a good call far outweighed any concern of safety issues. Young, immortal and reckless, many of us were—let’s face it—the safety manager’s worst nightmare. And where is your organization’s safety culture today, given the youth, mindset and adventure that each day in EMS brings? It may be high time you gave it some serious thought. Safety culture has been described as the shared beliefs that an organization’s employees hold relative to workplace safety. Personally, I like how Terry Mathis of ProAct Safety described it in the October 2010 edition of the EMS Agency Research Network (EMSARN) podcast series: Safety culture is not only the actions and what we do when we’re being watched at work… but also the reason why we behave in a particular way. Said differently, behavior is the foundation of a successful safety management system (SMS), based on shared beliefs that safety is a priority. Ask any engineer or architect how to build a sturdy, long- lasting bridge, building or highway—the answer you’ll undoubtedly get is to start with a strong foundation. Similarly, the “weight” of an SMS is built on, and supported by, a positive and proactive foundation of safety culture. I operationalize safety culture by thinking about first impressions, recalling the first few days of work at prior and current places of employment. I think about the way the work- place appeared on the outside. Was it run-down or well-kept? Was the inside neat or messy? I think about how I was greeted by employees: Were they nice? Did they smile, and were they generally in good spirits? Did the representatives of the organization look me in the eye or avoid such contact? We all do it: We have gut reactions in which we establish long-lasting opinions of new acquaintances or new places based solely on first impressions. They stick with us. They shape our thinking, perceptions and, yes, our behavior. For instance, I believe that if an organization is lax in its appearance, it may lead to a culture of low expectations and thus lower employees’ defenses against error, adverse events and accidents. In contrast, an organization that values adherence to protocols and communication with patients, partners and leadership—one that values a kept and tidy station and ambulance—I believe those standards impact employees’ behavior and beliefs to be positive, thwarting the threats to poor safety outcomes. While the terms “safety culture” and “safety climate” are used interchangeably, their meanings differ slightly. Safety culture references deep-seated patterns, core beliefs and behaviors, while safety climate refers to the current perceptions (status) of safety in the workplace. Surveys are the most common way to measure safety culture and safety climate. Their utility is analogous to the oil- stick in our car’s engine: Periodically we need to check the oil in our car. Low levels indicate a potential problem; oil levels at or slightly above the full line indicate that the engine is most likely working properly. Safety culture surveys serve as an “oil- stick” check of the overall workplace engine. As an investigator, I am not too concerned with how different people define or describe safety culture or if they prefer to use the term safety climate. What worries me is measurement—the oil stick. To gain reassurance that our workplace is working properly, we need reliable and valid measurement. To compare and contrast our measurements over time or to other organizations, we need reliable and valid measurement. Does the proposed tool for measurement actually measure what it is intended to measure? If not, the tool is not valid and of no use to anyone! Can the survey tool be used over and over again in different settings and produce a set of measurements as intended? If yes, then the tool is reliable. In 2007 we set out to develop the EMS Safety Attitudes Questionnaire (EMS-SAQ) to measure safety culture in the EMS setting. First, we evaluated the multitude of published safety culture survey tools. Surveys were developed for the hospital, long-term care, ambulatory care and other settings. We focused our attention on the ICU version of the questionnaire, as it had been widely used and had positive indicators of reliability and validity, and data for benchmarking EMS against other settings was readily available. Next, our team developed and tested a pilot version of the EMS-SAQ in three EMS agencies. This first study was designed to test acceptance of the survey among EMS personnel, answer questions about feasibility in administering, and test the psychometric properties of reliability and validity. The results: The tool is easy to administer, EMS personnel interpreted the survey items with no trouble, and psychometric analyses determined the tool is reliable and valid in the EMS population. We conducted additional psychometric tests in a second study that was primarily focused on establishing benchmarking data for EMS agencies. That study was recently published in the Prehospital Emergency Care Journal and identified wide variations in safety culture scores. While prescriptive safety culture interventions can be employed following the survey, there are no known evaluations of interventions based on EMS-SAQ scores. Ideally, safety interventions should tie back to the elements of your SMS. Several hospital-based safety programs have been researched, implemented and validated. If you are interested in these, head to the Internet and use the key words “comprehensive unit-based safety program,” or CUSP, to find more information. Regardless of the specific interventions, the first step to- ward a culture of safety is strong leadership. An EMS-specific CUSP has not been developed or published. Be the first! Finally, remember that the safety culture of a workplace is the foundation for good or bad behaviors among workers and contributes to safe or poor outcomes for patients and providers. One cornerstone of any safety program should be confidence in reliable and valid measurement.